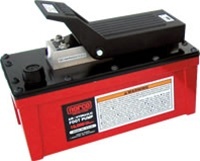 Norco 72200C 22 Ton Capacity Air Operated Hydraulic Floor Jack. Long "T" handle helps in positioning jack under vehicles with low overhang. Jack load release top mounted at "T" handle and allows operation at any handle position Handle locking lever secures handle in either vertical, horizontal or 45 degree position. Compact design fits easily between tandem wheels. Rust inhibitive coating on ram and extension screw. Large diameter wheels make maneuverability easy. Self-retracting ram eliminates manual lowering of jack. Safety by-pass system prevents cylinder damage. Safety overload system prevents jack from being used beyond its rated capacity. Integrated filter protects air motor Fast lifting air motor Four removable saddles with handle mounted saddle holder included. Capacity – 22 Ton, Lifting Height – Low 13.75" High 18", Handle Length – 50", Width – 13". 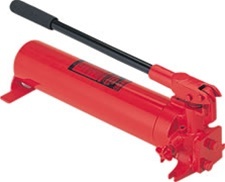 Be the first to review “NORCO 72200D 22 TON CAPACITY AIR OPERATED HYDRAULIC FLOOR JACK” Click here to cancel reply.